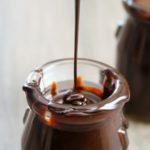 Chocolate Sauce – A fabulous chocolate sauce recipe to pass down the family line- easy and decadent and vegan to boot! – cacao powder, maple syrup/ agave syrup, pinch salt, vanilla extract, melted coconut oil, Blend all ingredients except the coconut oil together. Add the coconut oil while the blender is still running. Store in a jar in the fridge until you need to use it. If it has thickened, soften it down by warming over a bowl of boiling water. A fabulous chocolate sauce recipe to pass down the family line- easy and decadent and vegan to boot! Blend all ingredients except the coconut oil together. Add the coconut oil while the blender is still running. Store in a jar in the fridge until you need to use it. If it has thickened, soften it down by warming over a bowl of boiling water. Wonderful served with our Easter swirled chocolate cheesecake!